Height adjustable from 27" to 42"
Invacare Overbed Tables are practical, easy-to-use units for home and institutional use. The height of the overbed tables easily adjusts for comfort while reading, writing or eating and they feature an attractive walnut wood-grained laminate top with a T-molded edge that's designed to resist damage. 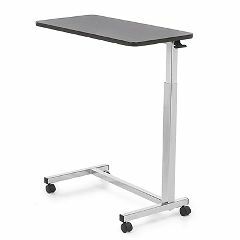 The heavy-gauge chrome-plated, tubular, welded steel construction ensures durability, and the 1.5" casters ensure smooth mobility of the table in any direction. A light upward touch on patented spring-loaded locking handle allows the overbed table to elevate freely. Light upward touch on patented spring-loaded locking handle allows the overbed table to elevate freely. Attractive walnut wood-grained laminate top with flush-mounted T-molded edge is designed to resist damage. Unique "I" base design permits use with chairs. Durable, heavy-gauge, chrome-plated welded tubular steel construction. Supports up to 50 pounds of evenly distributed weight when the bed table is in the lowest position. Height Adjustment: 29" - 45"
Great as side table for wheelchair. Our daughter is 32 and has cerebral palsey with one arm that is cntracted from a previous surgery and has minimal strenght in her right arm, can sit up in the bed and feed herself. My husband is disabled and it is hard for him to stand for long periods to feed her. I would like to have a lift for her but too expensive right now..
Caregiver. Medical Professional. Average Health. We use it as a bedside table for mom. She is recovering from hip surgery. It has plenty of room for her things &amp; we play cards on it , just to pass the time. Assembly was very easy.We plan on continuing to use it after recovery because it it is so convenient for her. It is plenty sturdy. I put my laptop on it when she wants to cruise the internet. Safe. Sturdy. Lightweight. Easy Storage. It was easy to assemble. Medical Professional. Average Health. back problems. terrible back problems. Keep it at my bedside; use as table at night. It rolls &amp; adjusts easily. Easy to keep clean. Size is perfect. Every thing about it is great! I HAVE RUG IN MY HOUSE. WILL THE BEDSIDE TABLE ROLL ON CARPET? Table top measurements? Height of lowest position? Can wheels be removed easily; if so by how many inches will that reduce height?Weight capacity? HOW ADJUSTABLE IS HEIGHT..FROM WHAT TO WHAT? MAXIMUM WEIGHT SUPPORTED? DIMENSIONS OF TABLE? The height is easily adjusted from a minimum of 27.5 inched to a maximum height of 39 & 3/8 inches. The table top dimensions are 30" long by 21" wide. Its ability to support something heavy is very poor. My top easily pulled out of its screws without much weight being involved. I drilled through the top and installed a few nuts and bolts with washers. The top can now support a great deal of weight, 25 pounds wouldn't be a problem now but I don't know what the max would be.